Have you seen the prices for umbrella stands? They go as high as $400, even at Lowes… for an umbrella stand!It just blows my mind. Last weekend I built one for $15. Ana White has great plans for a Pottery Barn inspired umbrella stand/side table which Pottery Barn used to sell for over $300. 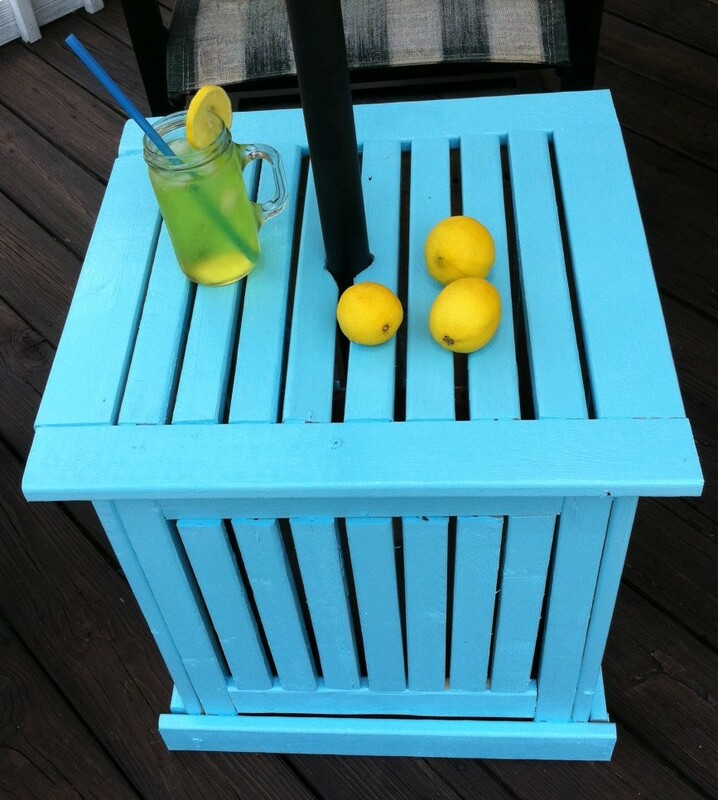 I painted mine with some left over turquoise paint because I wanted a pop of color on my patio. 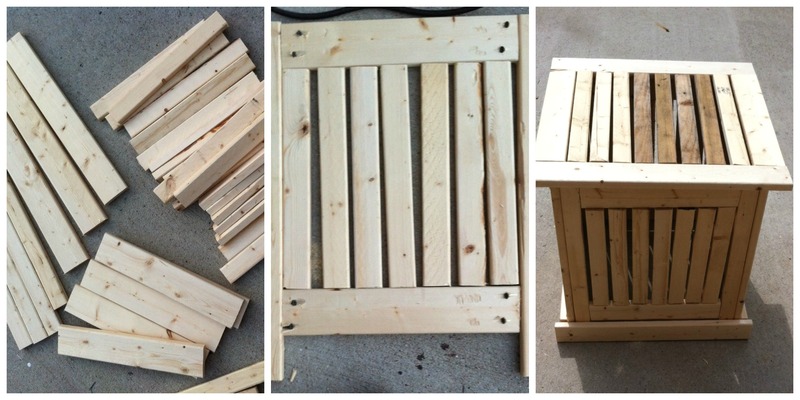 The project is fairly easy, but there is a ton of cutting involved. Well worth it though, considering I saved a ton of money. Here are a few pictures of my building process. The few darker pieces are leftover 1x3s from my scrap pile. I found an old PVC pipe in the garage which was a perfect piece to hold my umbrella. I poured Quikrete around it and let it dry over night. Until I have time to build a patio table, we’re using this piece as the actual table. We’re not too picky in this house. I am happy with my umbrella stand. I think it matches my DIY wall art. 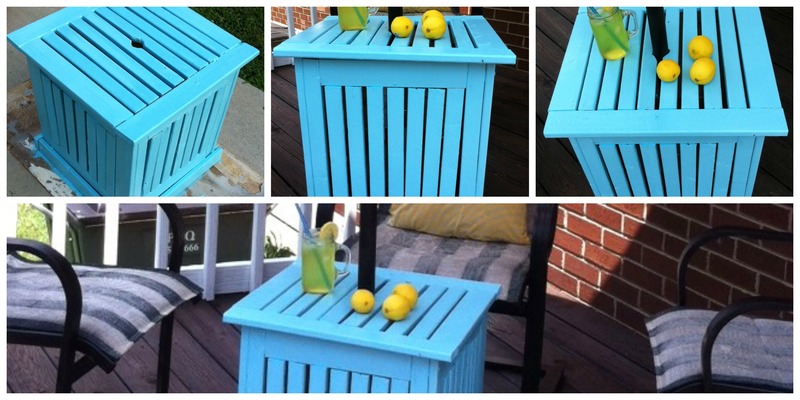 What a neat idea, especially for a small patio where you can’t fit a big table. We’ll be featuring your table over at Someday Crafts tomorrow. Hope you can stop by! Thanks, Miranda. I really appreciate your kind words and thank you for the feature. I am still fairly new to blogging, so this means a lot to me. 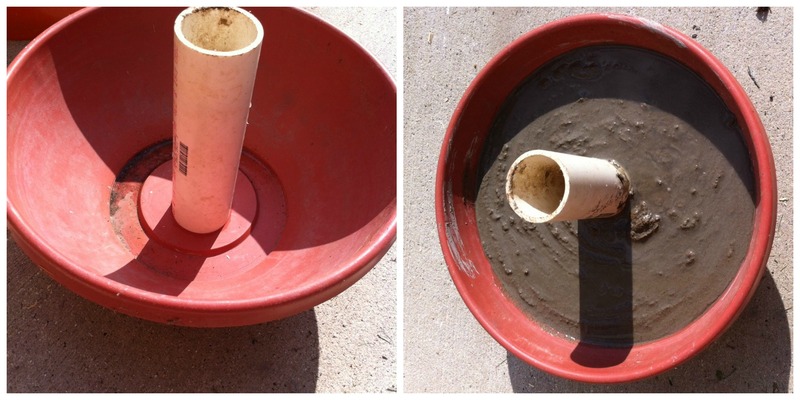 That is a wonderful DIY project. SO many of us can benefit from this. Love the color too! I really need a shady spot and this would be so budget friendly. Thanks, Chrystal for the kind words. You are right about this stand being “budget friendly.” I cannot see myself spending $200 or even $80 on an umbrella stand. Thanks for stopping by. coming over from Merry Mondays. your stand looks amazing. funny, i am just completing a post for “my” umbrella stand that I will be putting up soon. yours is like a piece of furniture. great idea. Thank you, Peggella for stopping by and the kind words. I am looking forward to seeing your umbrella stand. I am sure it’ll be awesome. Thank you, Stacy for your kind words and for stopping by. Great idea Sabine. Every umberella stand should have one of these. Pinned! Thanks, Michelle. I appreciate your comment. Thanks for stopping by. This is so perfect! I love the color too! Thank you for commenting and for stopping by. Have a wonderful day! Very, very pretty 🙂 Love the color you picked! Pinning! Thank you, Kendra. I really appreciate it your comment. Thanks for stopping by! 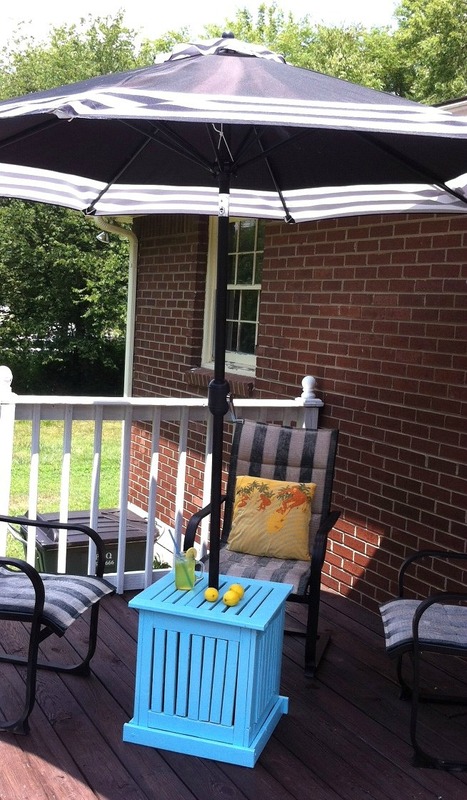 Kathryn, thank you so much for featuring my umbrella stand and for hosting the party. Have a wonderful day. Thanks, Shanice. I will for sure link up! I came across this page on a random google search. I know it’s been a few years, but would you happen to remember where you got the black and white patio umbrella? I am looking for one just like it and am not having any luck. Hi June! The umbrella is from Aldi. Hello, I love the color you painted this…you wouldn’t happen to recall the name of the color would you?